1.5 kg (3.3 lbs) approx. 120 V AC, 60Hz (220/240 V, 50Hz for the units purchased in Europe/Australia) 18 W max. This interface receives serial, asynchronous ASCII data. 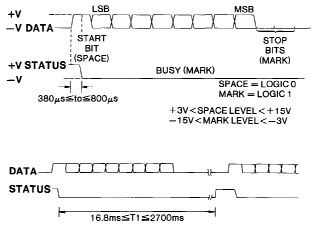 Signals on this circuit are generated by the Computer for transmission of data to the Printer. One-code ASCII data is received. The PAPER FEED Key is pressed and data is received. Paper is jammed so that the Printer cannot shift the print head. Executing the Self Test Printing. This signal wire establishes a common ground between the Printer and the Computer. 1 START BIT + 8 DATA BITS +2 STOP BITS no parity bit. 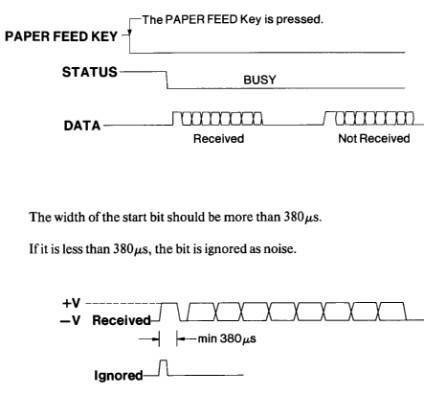 When PAPER FEED key is pressed, the status signal does not go LOW (BUSY) until the computer sends a byte of data. The TP-10 can receive this initial byte of data but will not print it. Subsequent bytes of data cannot be received. The status signal stays LOW (BUSY) until the PAPER FEED key is released. The received data is printed and subsequent data can be received.